Dear friends of mine who opened their house and their life to me when I was in college could sure use your prayers right now. I nannied for their sweet baby girl, Saylor for two years. This is the sweetest little family you'll ever meet and they mean so much to me. Their second baby was due to arrive in December, but He had other plans, and he instead made his big debut today. He is nine weeks early but is a fighter so far. Amy went in to be checked out after not feeling him move. Emergency c-section saved his life, as his cord was wrapped twice around his neck. 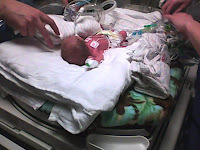 Bohdy Brandon was born on October 9th, 2009 tipping the scales at 2 pounds, 6 ounces. Please pray for continued development for Bohdy, strength and faith for Amy and Steve, and wisdom for Bohdy's nurses and doctors. Praying for Bohdy here. Keep us all updated. Blessings to you and your family as well. We will definitely keep this "early arrival" baby in our prayers and hope for the best for that family! Saw Kelly's RT...our own sweet girl was 14 weeks early last June. Preemies are amazing warriors...Bohdy will be in our prayers!